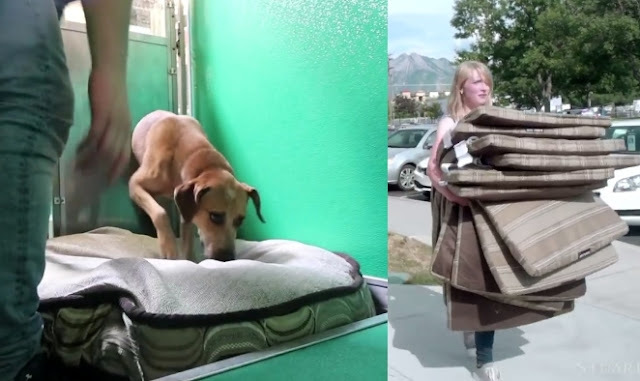 White Wolf : Man Buys a New Dog Bed for Every Single Dog in the Shelter! Man Buys a New Dog Bed for Every Single Dog in the Shelter! It’s true, sometimes shelters can seem a bit of a sad place to be. When Stuart Edge went to visit a particular shelter, he noticed right away that unfortunately, there were dog comfy beds on which the dogs could sleep. Stuart Edge felt last week when he arrived at the Janice R. Johnson Center for Animals in Deseret, Utah to volunteer at the shelter by walking the dogs and providing them with playtime – a small gesture everyone would enjoy. Before Edge headed off to the shelter, he called and asked what he could bring to lend the dogs some comfort, while they waited patiently (some impatiently) waited for their new families. The staff explained how the dogs would enjoy some soft beds – after all most slept on hard concrete floors, as if being in a shelter wasn’t difficult enough to have to cope. And with that, Edge garnered the support and attention of his friends – and off the group went to find dog beds – a lot of them! Filling up his car with fluffy beds, Edge and his squad of dog-loving volunteers made sure every dog was comfy. First it was playtime; the happy dogs couldn’t get outdoors quick enough. When that was over – even though it was time to return to their kennels, those fluffy beds made life at the shelter just a little bit more tolerable. Responses to "Man Buys a New Dog Bed for Every Single Dog in the Shelter!" Very, very nice idea but should the beds be raised? Pee and wet poo has a tendency of getting on material and staying there. Move cleaning or just throwing out the nice bed. Better to get good info first.